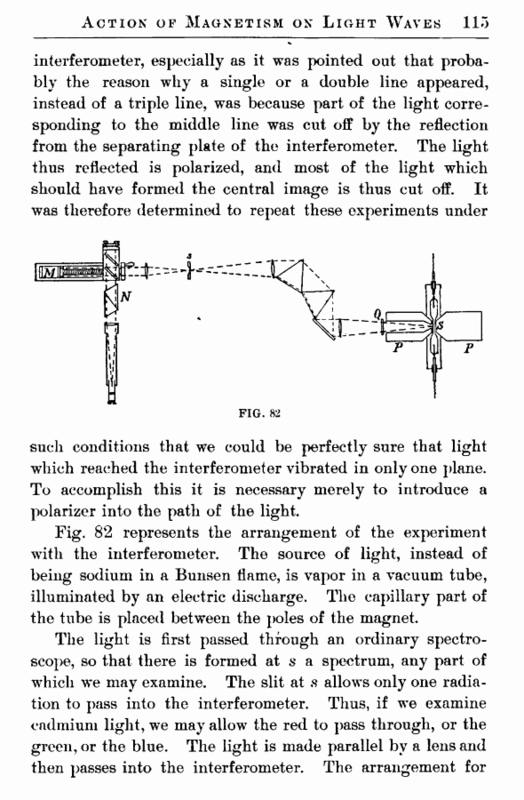 such conditions that we could be perfectly sure that light which reached the interferometer vibrated in only one plane. To accomplish this it is necessary merely to introduce a polarizer into the path of the light. Fig. 82 represents the arrangement of the experiment with the interferometer. The source of light, instead of being sodium in a Bunsen flame, is vapor in a vacuum tube, illuminated by an electric discharge. The capillary part of the tube is placed between the poles of the magnet. examining separately the vertical vibrations alone and the horizontal vibrations alone is represented at N, and consists merely of a Nicol prism which can be rotated about a horizontal axis. was obtained. These are shown in Figs. 83, 84, 85. The upper curve of Fig. 83 represents the visibility curve produced by the horizontal vibrations of the red cadmium light in a strong magnetic field. For the vertical vibrations the visibility curve is something totally different, and is shown in the lower half of the figure. The effect of the field is readily appreciated by comparing this figure with Fig. 66, which corresponds to the red cadmium line without any magnetic field. The upper curve of Fig. 84 represents the visibility curve of the blue cadmium vapor when the horizontal vibrations only are allowed to pass through. When vertical vibrations only are allowed to pass through, the curve has the form shown in the lower half of the figure. The case of the green radiation, when there is no field, is shown in Fig. 67 above. 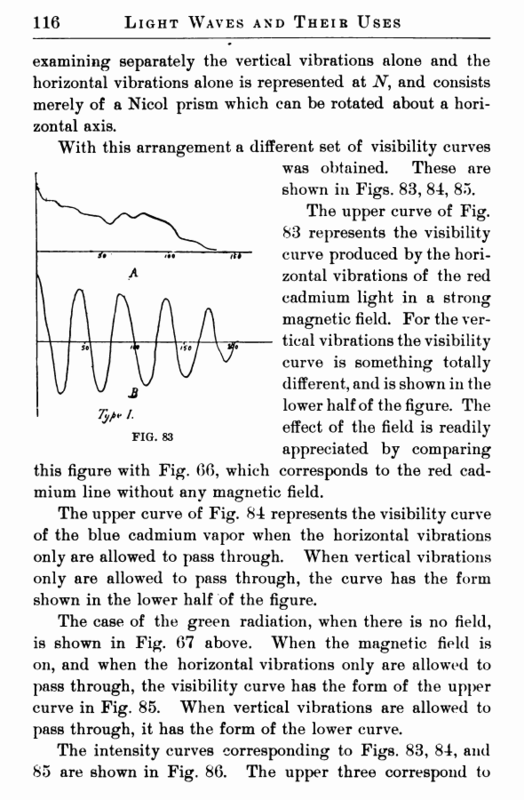 When the magnetic field is on, and when the horizontal vibrations only are allowed to pass through, the visibility curve has the form of the upper curve in Fig. 85. When vertical vibrations are allowed to pass through, it has the form of the lower curve.